When I visited Bologna which is sometimes referred to as the food capital of Italy, I ate so many wonderful things and loved almost all of them, however one particular dish stuck out in my mind and I found myself ordering it during my week there time after time. Gramigna With Sausage doesn't sound like anything too terribly exciting, but it's a flavor-packed dish that really treats the senses. Italian sausages can be very aromatic with robust flavors of fennel and gramigna, which is a particular shape of pasta is the perfect companion. The sauce is a little creamy, just enough to coat this delicious concoction and the result is a pasta dish that doesn't remind me of anything I've ever had before that holiday in Italy. 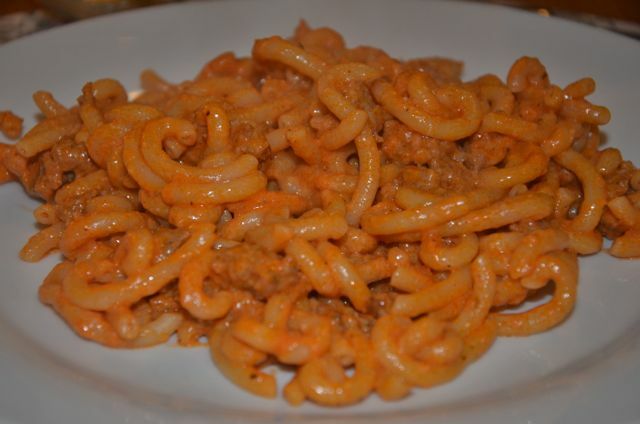 This is my version of Gramigna With Sausage… I ordered it in at least 3 different restaurants while staying in Bologna and I tried to take the best parts of each version of this dish that I sampled and put them together for a simple, delicious dinner. 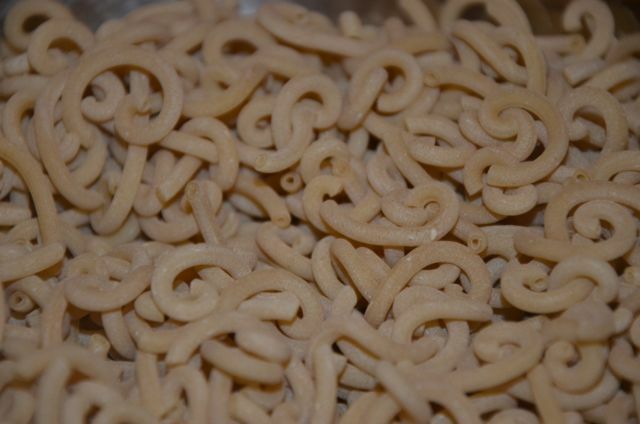 I picked up this gramigna pasta while in Italy, however you can sometimes find it in Italian delis or grocery stores. 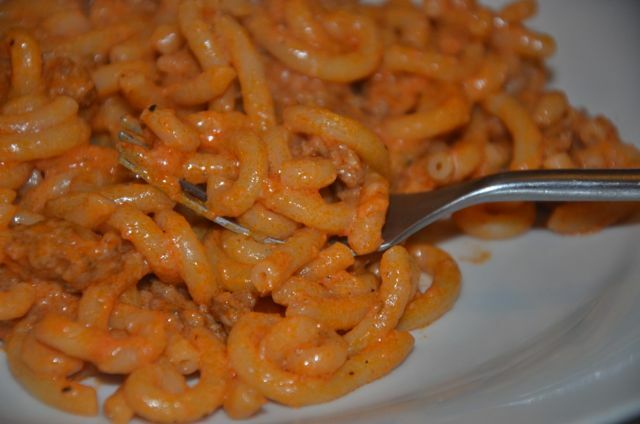 If you don't see it in your local shop, macaroni would work just fine or you can buy it online via Mediteranean Direct. 1. Put a large pot of water on to boil. When it starts to boil, add plenty of salt and a drop of regular olive oil before cooking the pasta in it. 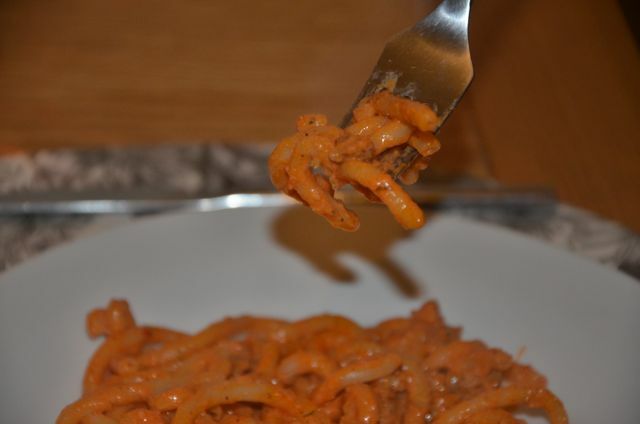 Check on the pasta a minute or two before it should be done as you want it to have a bit of bite to it. Be sure to reserve a cup of the pasta water and then strain the pasta, returning it to the pan with the lid on to keep it hot. 2. Meanwhile, remove the sausages from their casings. My butcher recently told me that if you run it under cold water just before removal, that it makes it easier. Slice down the side of the skin with a knife or a pair of sharp scissors and simply peel the skins off. 3. Warm the 2 tablespoons of olive oil in a heavy based frying pan over medium heat and cook the sausages, breaking up the meat with a wooden spoon as it browns. When it starts to brown, increase the heat to medium-high and pour in the wine. 4. Continue to cook and stir until the wine evaporates to almost nothing and then reduce the heat to low. Add the oregano and stir. While the wine is reducing, pour the can of tomatoes into a blender along with a 1/4 can of water to get all the juices out. Whizz in the blender until smooth. 5. Pour the tomatoes and cream into the sausage and stir to combine. Simmer for 15 minutes or so uncovered until slightly thickened. 6. Just before serving, grate parmesan cheese into the sauce to taste and stir to combine. Then pour the sauce over the still warm pasta, add several grinds of fresh black pepper and toss to coat. If it seems too dry, add a little of the pasta cooking water, 1 tablespoon at a time until you get the consistency you want. It should be slightly creamy, but not watery.